Twelve suites, LCD screens, food prepared by one of India’s top chefs and 471 seats. No, it’s not a luxury hotel we are talking about. These are the facilities onboard A380, the world’s largest aircraft, which will begin operations in India on May 30. The size and scale of the aircraft being brought to India by Singapore Airlines has had the Indira Gandhi International Airport (IGIA) undertake a series of measures to facilitate its arrival. On April 7, Singapore Airlines became the first airline to announce the double-decker A380 services to the country, after the Central government gave the green signal in January this year. The aircraft is scheduled to land at 8.05 pm on May 30 at the IGI airport’s Runway 29 and will take off at 10.20 pm. The landing and takeoff will be streamed on the Delhi Airport’s YouTube ID. The super jumbo jet will take over from the Boeing 777s and fly daily to New Delhi and Mumbai airports. In all, 14 flights will be operated from each city a week. “India is a particularly important market for Singapore Airlines and we are very pleased that more of our customers will soon be able to experience the spaciousness and comfort of the world’s largest aircraft,” David Lau, General Manager (India), Singapore Airlines, had said. The A380 offers travellers an unparalleled experience across three classes — Suites, Business and Economy. While the main deck boasts of 12 suites with unmatched luxury and privacy, Business class flyers will be treated to spacious 34-inch wide seats. Economy class seats will be have more leg- and knee-room, apart from in-flight entertainment on a 10.6-inch screen. The A380 will have 471 seats, including 12 suites, 60 Business and 399 Economy class seats. While an Economy class ticket will set you back by Rs 30,000, the Business class ticket will cost twice more and the suites will be priced at Rs 2 lakh each. 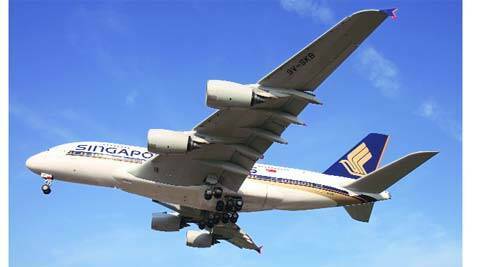 Currently, a one-way Delhi-Singapore ticket (Economy class) costs Rs 19,886, according to Singapore Airlines website. The key features of the suite are separate seating and sleeping areas, chaise lounge for companion seating and socialising, a 23-inch LCD screen, self adjustable roller blinds, manual sliding doors for added privacy and a personal coat closet. All single-window seats and double-centre seats in the Business class allow direct aisle access to flyers. The 34-inch seats also come with its own 15.4 inch LCD screens. To ensure the Economy class travellers are not left behind, each seat has Givenchy-designed fabrics, leather headrests, front-mounted foot-rest, coat hook, cup-holder, spectacle stowage and mirror facilities. The airline is planning to equip the upper deck of the A380 flying to Mumbai with only Business Class seats as there is a greater demand for business class seats from the city. The airline will serve a “Shahi Thali” designed by top chef Sanjeev Kapoor to all flyers. Suite flyers will be served Dom Perignon and Krug champagne.